We aren't the couple who claims not to even notice the fact that we come from two different cultures. It's noticeable. Pretty much all the time. Our skin isn't the same color. We didn't grow up eating the same food. Our families don't speak the same language. They don't even land on the same side of Protestant Reformation. Add to that the fact that we were born in different decades and spent our formative years on different sides of the globe, and you've got a pretty strange combo. The one thing we have going for us is that we're both born U.S. citizens, and I'm grateful for that (differing citizenship adds an extra level of complexity). Usually, we appreciate and value our different backgrounds. Between the 2 of us, we speak the 3 most widely spoken languages on earth. 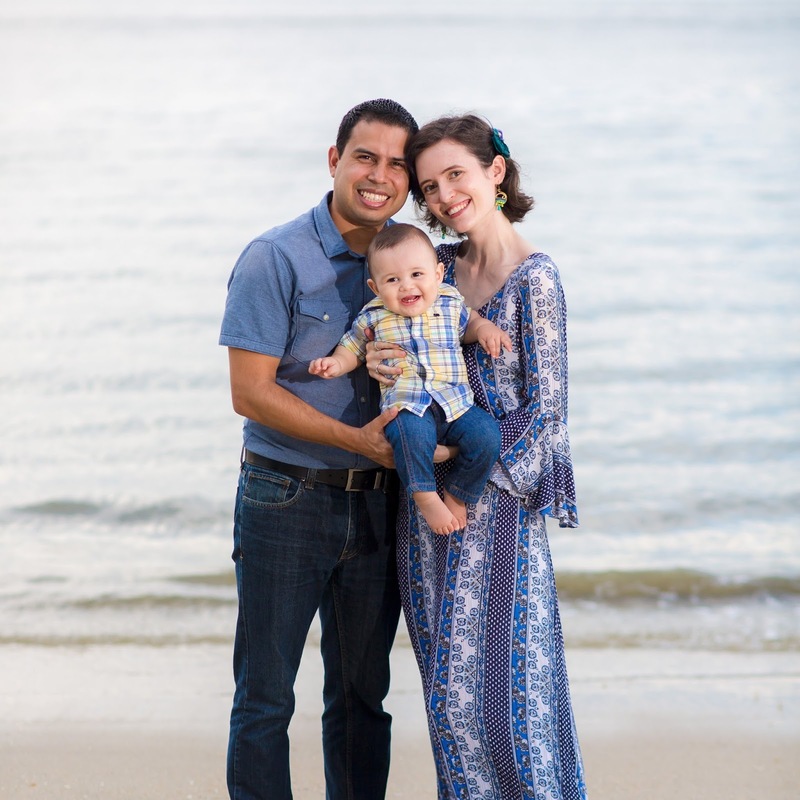 We talk about whether our children will have English or Spanish names (or English names with easy pronunciations in Spanish). I'm more aware than I ever was before about racism towards Hispanics in the USA (i.e. the man visiting the hospital who asked my ICU nurse of a husband if he moved to Michigan to work in the onion fields) and Angel is now far more interested in Southeast Asia and the local news of that region than he ever thought he would be. But times come when our lack of shared cultural background is a genuine cause of frustration. 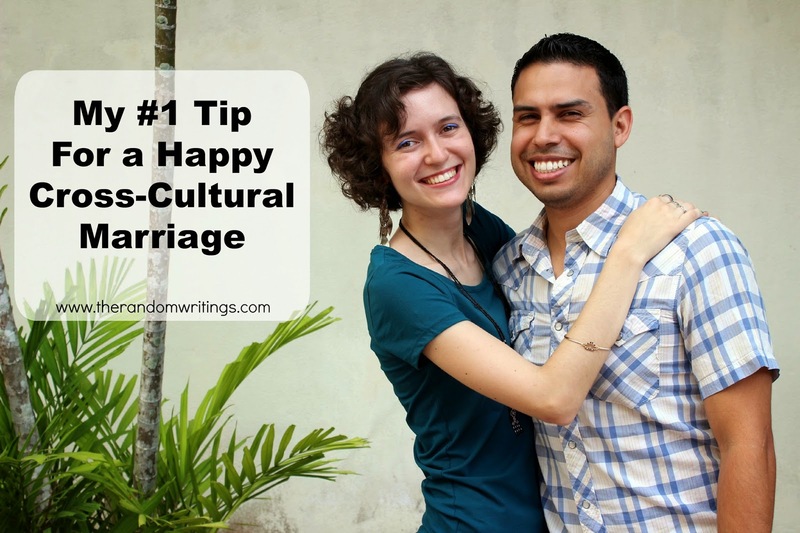 My biggest piece of advice when it comes to living well with a spouse whose culture is different from your own? Don't forget that your spouse doesn't know the things you know--prepare them for success by informing them ahead of time about cultural situations and expectations they're likely to face. Angel has told me recently that this move to China has gone so much more smoothly for him than it would have gone if he hadn't had me as a mediator to prep him for cultural expectations and rules of what life is like here. Even though I hadn't ever lived in China itself before, living in a part of Malaysia with a heavy Chinese influence and majoring in the language, history, and culture of China in college does a pretty good job of preparing you for the change. On the other hand, my most dramatic failure in adapting to cross-cultural situations brought on by marriage came in large part because Angel did not prepare me for something that is very different from my own native culture. Neither Malaysians nor Dutch West-Michiganders are known for being the touchy-feely type, especially with strangers and people of the opposite gender. I don't hug my own family members every time I see them, unless it's a first meeting after a long time apart--and I never kiss anyone on the cheek, except maybe my littlest sister--certainly not my father! Angel, on the other hand, is a hugger. He hugs my own relatives far more often than any of them hug each other, but because I had no prior experience with his culture, I assumed this was just a personality quirk and not actually a cultural phenomenon (and I did helpfully inform him that some of my relatives are even less comfortable with hugs than others, so that he'd tone down the physical affection a bit). The problem came the very first time I met some of Angel's extended family. I came down the stairs to find everyone seated in the living room, was introduced, and greeted everyone with a bright smile, a general wave and a "Hello! Nice to meet you all!" --was enveloped in a bear hug and a kiss on the cheek from someone standing nearby, found that slightly strange, but returned the hug, and found a place to sit down in the living room and listen in as best I could on the Spanish conversations going on (this was before my Spanish 101 class at college had even begun, so I was totally lost). That's my point of view--and for the point of view of a shy 19 year old being introduced to her fiancee's family for the first time, I behaved respectfully and appropriately for the situation. Turns out--there was a larger cultural phenomenon going on. I only found out later, that somehow during the course of my introduction, I'd managed to offend all of the elders present, who had assumed that like any good fiancee being introduced (or in general, any young family member walking into a room full of her elders), I would have made a round of the room, greeting each aunt and uncle with a hug and a kiss. Angel didn't even think of telling this to me ahead of time, because to him, it was simply an automatic reaction (and, in fact, he had done exactly the same thing upon meeting my family, although we'd chalked it up to "He's just being Angel..but why is he touching everyone?" instead of "Oh, this must be important in his culture."). I was crushed, because who wants to completely fail at making a good first impression on all of their future in-laws? Rough. But I'm glad it's a lesson we learned so early on. These days, we set each other up for success by making sure that the other knows what to expect before they're placed in a foreign situation. In 2013, Angel and I picked out Christmas presents for his family together, and he explained to me ahead of time about staying up till midnight on Christmas Eve (that's probably the only time I've stayed up till midnight in the last 3 or 4 years), and eating tamales. This year in February, Angel asked me all sorts of questions about ang pow for Chinese New Year--who do we give to? How much should be in the envelope? When do we give out the envelopes? For us, we've found it to be immensely important that we do not forget our differences. When we remember not to make assumptions based on a non-existent shared cultural background (weirdly, something that's all too easy to do) we help each other the way we ought. Aww, that can definitely be hard to remember when it's so much a part of your culture/the way you grew up that it's second nature to you. Case in point: I can't really think of anything in my culture that I'd have to alert my hypothetical significant other about, because so much of it just seems like it's common-sense/having-manners (I'm sure I'm forgetting something though ._.)! Great post! I think when we love someone we might forget to see the differences they have from us. It is important to acknowledge that they may not understand everything about our culture and background. So interesting! My husband and I come from the same culture but my family is also not very touchy-- we hardly ever hug! His family feels the need to hug every time you leave the house-- it has been an adjustment for sure! Interesting to read about your experiences! I love hearing stories of cross culture couples. :) I've never experienced anything like that before, but I'd love to travel to different countries to experience different cultures. I really love this Rachel! My husband and I are from different cultures but we grew up in the *same* culture, especially at school. We attended the same school from middle school to graduation, and then also went to similar colleges, so a lot of our experiences were similar. I think however that our family cultures are different, and we've had to accept and adjust without criticizing. It was so good to get some insight into your experiences too! this is such a great post! my husband is definitely the touchy-feely type (he's texan, maybe that's it) and my family is also dutch (heeeey!) and less touchy feely too. in the beginning of our relationship i almost told him too much how to act around my family because he's such a loud personality and part of my family is more quiet and reserved. he felt like i was telling him i couldn't be himself so i have to be careful of that. thanks for sharing the piece on how you accidentally offended the elders by not greeting them individually. it's really interesting how different cultural norms exist in all parts of the world. Such a great post. I am dating a guy (fresh and new) that is from a completely different culture and background. Love the perspective! SO interesting. It's a good thing you guys have such strong communication, so you can navigate. :) Yeah, I'm even blown away by how differently my husband's family and my family do things, even though we were both raised in the Western US and Mormon! His family is full of boys and they tease each other brutally, they holler and wrestle, but they love each other like crazy. When I was first around their family (I mean even now, ha) I get overwhelmed at family functions and have to find a place to chill. And I have to try not to get my feelings hurt. My family jokes and we're loud too, but no where near them! Ha! I grew up in a biracial household so I definitely understand this. And now the bubs is another race and our kids are totally mixed. I try to introduce all different cultures to the kids and we celebrate and decorate for a bunch of different holidays like they're our own. great post. Sometimes just family cultures make it difficult even when racial cultures are the same. The same tips here can be applied. Thanks. Good for you! Very inspiring and eye-opening post.I'm so happy you two found eachother..you look so happy! That's great that you guys have figured out each others' differences and keep the line of communication open. I can't believe the nurse would say that to him!! How awful! And the first time you met his family?? Oh man. My family is a hugging family too and I remember when my sister brought her husband for the first time she told him we are huggers and he was a little over the top hugging everyone... so you could go either way. :) Can't win I guess. Love this! It's amazing how our perception of "normal" depends so much on our culture. It's hard to explain your culture to someone - because it's not even something you're aware of! Great post! I am very Americanized but my parents are very traditional Chinese so when my hubby (then boyfriend) met my parents, I sort of let him know they are very Chinese in that they don't show any affection. To this day, he still thinks it's weird but understands it's just the way they were brought up. This is an awesome tip even for those of us who aren't in cross cultural relationships. My husbands family and my own family have some differences that neither of us were expecting to be big issues, and like you mentioned, they weren't IF we remembered to let the other know what to expect. Holy batman, spot on! Our first year was CRAZY. We spoke different first languages - him French, and we somehow managed to offend each others mothers in incredible ways. It is so hard to even explain your own culture to someone raised somewhere completely different, on a different continent. We used to notice being stared at all the time, and now I think we are just used to it. I think this post is right on! I feel like one of the greatest benefits for cross-cultural couples is that we're more aware of our differences and prone to guide each other in our cultures. (I wrote about it a little here, if you're interested: http://www.alifewithsubtitles.com/2014/01/go-for-it-1-advantage-of-cross-cultural.html.) And one more post, just because I could relate so much. My hubby is Guatemalan, and I am still so awkward at kissing and greeting, I wrote this "American Girl's Guide to Kissing" you may enjoy: http://www.alifewithsubtitles.com/2015/05/an-american-girls-guide-to-kissing.html. So glad to meet another multicultural couple. Thanks for writing! It is a common thing. When people are transferred within their employment or move to other states, transportation becomes an issue for your property.